You've heard of Tim Dinsdale, F. W. Holiday, Robert Rines and lots more. But what about William Horsburgh Lane? Back in the 1930s when the Loch Ness Monster came to the fore, retired Lieutenant Colonel Lane lived at the Tigh Na Bruach residence near Invermoriston with his wife Agnes. Having seen action in the Far East with the Indian army he moved from the heat of the battlefield to another area of contention - Loch Ness. He was already a man with a taste for the explorer of the exotic and mysterious having written a book on his involvement in Babylonian excavations. As a topographist he joined in the excavation of the 5,000-year-old archaeological site of Kish, 50 miles south of Baghdad (from which his photograph here was taken in 1923-1924). Now as he settled into the quiet life on the shores of Loch Ness, Nessie reared her compelling head. Lane's interest was piqued and the first we hear of him was in a letter to the Inverness Courier on the 10th October 1933 (extract below). In this letter he commends the theory that the monster is a species of giant salamander. This was based on his experience in Burma where he came upon a four foot specimen in the jungle. 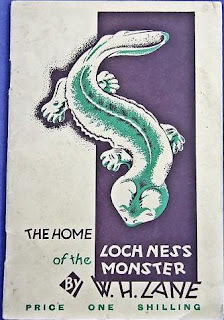 Evidently as the media interest in the monster continued apace W. H. Lane proceeded to write himself into the Loch Ness Monster folklore by publishing the first ever work on the creature entitled "Home of the Loch Ness Monster" published by the Moray Press around March 1934. The cover is shown below and as you can see the salamander theory is given prominence. This was before the famous Surgeon's photograph was taken in April 1934 and long necked Nessies had not quite taken all other theories prisoner. 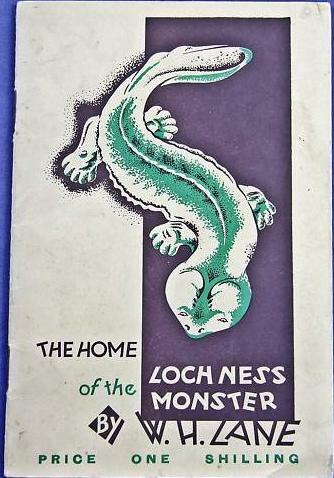 The book is an interesting little work which I shall review with other Loch Ness Monster titles of 1934 in another posting. W. H. Lane was now very much part of the Loch Ness investigation and from his shoreside home near Invermoriston he was well placed to scan the loch surface for its mysterious denizen. This came to the fore when another retired Lieutentant Colonel, Rupert Gould, published his seminal work "The Loch Ness Monster" in the summer of 1934. These two ex-combatants had struck up some kind of friendship as it seems that they were in communication. Gould mentions a letter from Lane a week before his arrival at Loch Ness in which Lane describe an incident where a log came down into the loch as the River Moriston was in spate. Lane followed it with his binoculars whilst those with no optical aid were sure they had seen the monster. The old campaigner Lane was not fooled and watched as the log drifted across to the west side of the pier. Gould also discusses Lane's Courier letter on the salamander theory but dismisses it on the grounds that no salamander has exceeded six feet and no fossil had been found greater than twice that length. Whether Lane changed his mind on that theory we may never know but undeterred he continued his watch of the loch and wrote another curious book in 1936 entitled "Eden". This book combined his religious beliefs with his archaeological interests to attempt to pinpoint the ancient location of the Garden of Eden. Interestingly, the book's foreword is written by Count Bentinck who takes the opportunity to cite Lane's interest in the Loch Ness Monster and claim his own sighting in 1935! Lane also revisits in this book some non-Nessie aspects of Loch Ness which he had previously mentioned in his Loch Ness book (again we will return to this in another post). But Lane finally got what he wanted - a sight of the Loch Ness Monster. The incident is related in Witchell's "The Loch Ness Story" and tells us of Lane's sighting in May 1945. We are told that Lane was with his wife and two neighbours at their home. "It was a huge black object. Watching it closely, it remained about two minutes on the surface, after which it suddenly disappeared leaving a big wake on the loch." "There was a slight curve in the wake, which looked, as far as I can judge, as if a moving torpedo was in the water. There can be no doubt it was made by a large, fast-moving object." And that was that. The following year on the 10th September 1946, W. H. Lane died aged 72 and went to meet his Maker. One presumes he is now fully informed as to the identity of the Loch Ness Monster. His wife, Agnes, died in 1967 and Tigh Na Bruach is now a Bed and Breakfast property. So ends this brief description of an unsung monster hunter. No doubt there were quite a few like him but we are unlikely to hear much about them now. Personally speaking, his life intrigued me and I did try to find descendants but I am quite convinced from public records that he died childless and anything pertaining to his work on Nessie is long gone or hidden in the recesses of a dark forgotten attic. We leave the final words to W. H. Lane from his book. "It soon became palpable that some beast of huge dimensions did actually inhabit Loch Ness." We agree and seventy six years on the search continues. I had the pleasure a couple of years ago of visiting the beautiful Scottish island of Mull. Whilst taking in the sea eagles, multi-coloured houses of Tobermory and the religious island of Iona we decided to visit the local stately home called Torosay Castle (website is here). I was expecting just another trip round elegant rooms and various items of arts and craft ending in a gift shop but was delighted to find this was also a stately home with a monster edge to it. As it turned out it was the home of the late David James - Member of Parliament and co-founder of the Loch Ness Phenomema Investigation Bureau in 1962. You can read his Wikipedia entry here. As we toured this place I was enthralled to see items which hearkened back to my youth. The best reminder of all was what looked like the original and famous "Nessiteras Rhombopteryx" painting by Sir Peter Scott now hanging in one of two rooms dedicated to Nessie hunting! My picture of it is below. It was quite a feeling seeing the original which has regaled many a book, newspaper and postcard. Now looking at the castle website you would not think such treasures were inside (perhaps his son is a little embarrased by it all!) but I am sure they are still there and awaiting the inspection of any Nessie-phile who happens to pass by on their holidays. I will put up other pictures of my visit in the weeks ahead (the next article is here).